Please refer to our stock # 3248 when inquiring. Egyptian, Ptomemaic Pottery Vessel of a Recumbent Lion, 300 - 100 BCE. 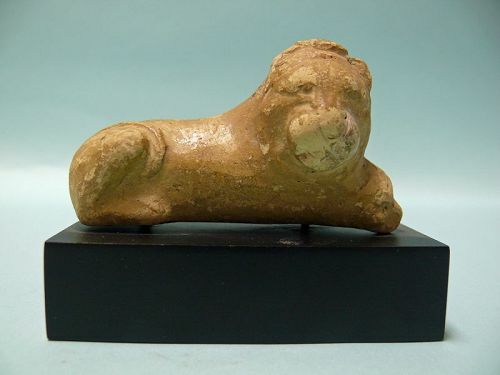 Mold-made with mouth of vessel on lion's head. On black custom stand. In very good condition. 2" x 3 1/2" x 2", on stand height is 3". Ex: Archaeological Center, Ltd, Jerusalem. The Ptolemaic dynasty, sometimes also known as the Lagids or Lagidae, was a Macedonian Greek royal family, which ruled the Ptolemaic Kingdom in Egypt during the Hellenistic period. Their rule lasted for 275 years, from 305 to 30 BC. They were the last dynasty of ancient Egypt.